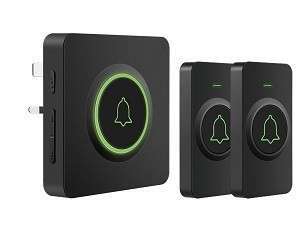 Wireless Doorbell Buyer Guide: Take a look at our roundup of the top-rated wireless door chimes. Any Problems With You Wireless Doorbell? Picking a new wireless doorbell isn’t easy, even if you know the type of wireless doorbell you are looking for! You may want a waterproof wireless doorbell, or you may want a wireless doorbell with video integration. Here we take a look at the best common, push and play wireless doorbells. The Coolqiya is an awesome, dependable wireless doorbell. It is at the top of our list! 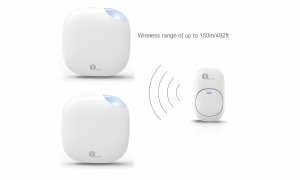 Number 1 is the fantastic Coolqiya Wireless doorbell, which is the best option. It is the best option simply because it is the most flexible in terms of what you are likely to need. 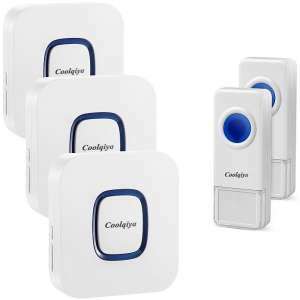 The Coolqiya doorbell is expandable (up to 10 wireless door chimes), waterproof, loud, and has an awesome working range! If you are deaf or hard of hearing, the bright LED will alert you to any visitors too. The doorbell is backed up by a 24-hour customer service team and a 1-year warranty to boot. Ket features include 52 different ringtones (including dogs barking, piano tunes and the classic ‘ding dong’). 4 volume levels, the possibility of working at over 100 feet, easy expansion to over 10 receivers, a working temperature range between -30℃~70℃ and an awesome IP55 waterproof rating! 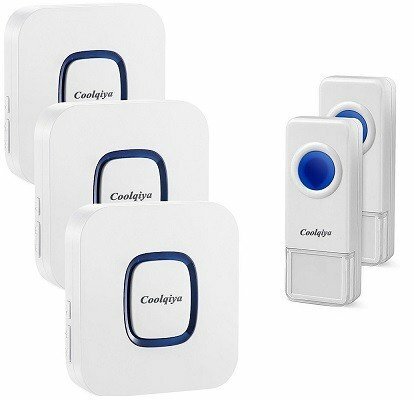 If you are looking for an awesome wireless doorbell, the Coolqiya should be top of your list, because it is top of ours! The LED on this solution is more than bright enough. 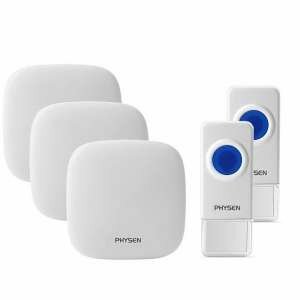 In fact, if you are looking for a wireless doorbell for the deaf or hearing impaired, then this Physen doorbell is the best option. If you are not completely deaf, this option has volume levels right up to 100dB, which will help to alert you to a visitor at your door. It is clear that Physen was thinking about that when they designed this wireless doorbell unit because it is the most obvious thing about it! We also love the doorbell push button, because it is slightly different from those you have seen on this page so far. It has no clear plastic section for notes, but it is very minimalistic, and we like that. In terms of chimes, it has 52 (as per usual for Physen), and the volume can reach up to 110dB. There are also multiple chimes and a working range of up to 1000 feet to ensure you do not miss any visitors to your home or office. This Physen is super easy to install and has 3 great looking wireless door chimes. The Novete wireless doorbell is great looking, especially the push button, which is slightly different to the other options. The Novete wireless doorbell is quite new to the market, but it had to be on this wireless doorbell list on features alone!. There is no doubt that this is one of the loudest wireless doorbells available, which is perfect for those who are hard of hearing. The Novete has the ability to hit sounds at 115dB, which I am sure you will agree is more than loud enough. It is not simply a loud wireless doorbell though, it is a great option if you live in a cold or hot climate. With a working temperature range of -4 °F to 140 °F, it is sure to fit your needs. 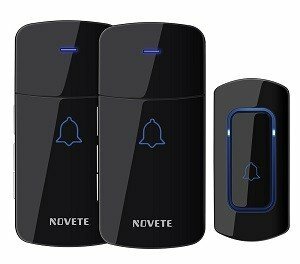 Regarding the distance, the Novete wireless doorbell has been rated with a maximum working range of over 1300 feet. I am not sure about you, but my house was that long, I would probably go for weeks without visiting parts of it! That being said, 1300 feet will surely give you some confidence that it will work within the confines of your home. There is a small LED which is great if you want the volume off (which is also possible with this wireless doorbell), although it is small, so you may miss the odd visitor if you are not paying attention. If you decide to go for the Novete, you will also receive a 100% satisfaction guarantee, which means you can send it back if you are not happy. We love the look of the Bitiwend wireless doorbell! It is minimalistic, but still one of the best wireless doorbells! The Bitiwend wireless doorbell also has the ability to add multiple wireless doorbell chimes, and is a fantastic looking option! Inside the kit, you will find 3 receivers and 2 push buttons to give you a head start. The push button and the receivers are really easy to pair up and super easy to install. The minimalistic design of the wireless doorbell chime is what first attracted us to the Bittiwend, and is one of the main reasons we HAD to include it is this list. It has many of the same features as the other options on here, including 52 chimes, an IP55 rated push button, and a volume range between 25-110dB. Another great feature is the LED, which is perfectly clear and easy to spot, a great design if you are looking for a wireless doorbell for a deaf person, or a person who is hard of hearing. The Bitiwend is backed up by a 100% satisfaction guarantee! Similar to the D-3C, the DB-21 also has the ability to leave your ears ringing at 115dB, making it a great choice if you need a loud wireless doorbell. It is a good looking doorbell, it just does not look at modern as the D-3C, and that is the only reason it is just underneath it on this list. 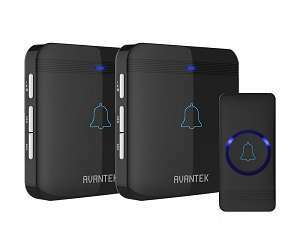 As we mentioned above, Avantek has made some great wireless doorbells, and the features are very much the same as all the other models. It is loud (115dB), it is weatherproof (IP55 and working temperature range of -20 °C-60 °C), and it can work at a range of over 1300 feet. What we love about this particular wireless doorbell is the lighted button, which will enable your visitors to know that the wireless doorbell is working, even if they cannot hear it! To be honest, if you crank the volume up to the maximum, they will not have a choice BUT to hear it! It is LOUD! 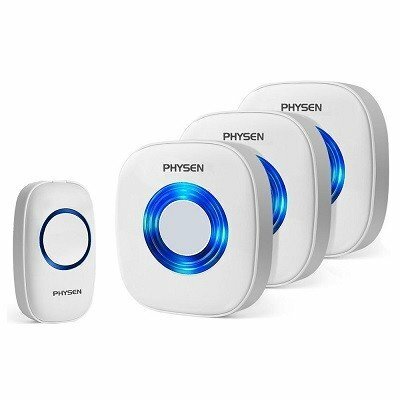 This is a fantastic wireless doorbell by Physen. Its minimalistic design will fit perfectly into any home. The Physen H1 is the ultimate cold weather wireless doorbell! With an operating temperature range of -30℃ to 70℃ and a waterproof rating of IP55, you are covered for all weather conditions, hot or cold! We love the look of the Physen H1, and although it has some competition (even from other Physen models) it is the best that Physen produces. Although the wireless doorbell push button is very basic looking, it does have one advantage over some of the other doorbells on this page. That small advantage is the ability for visitors to place a note in the clear plastic section at the bottom of the push button. Ok, it this day and age, maybe they will choose to send a text, but it is good to have the option. The receiver is minimalistic which we love, but if you are hard of hearing, there are better wireless doorbell options. There are 52 chimes with the Physen H1 too, and it also works at over 1000 feet. Not only is the Physen H1 great for cold weather (and hot weather too! ), it holds one of the highest IP ratings for a wireless doorbell, which is IP55. The unit also comes with a 1-year warranty. The 1byone Easy Chime wireless doorbell in an excellent, cheap, push and play wireless doorbell. It is nothing fancy, but it does the job very well and looks fantastic! It has a working distance of 500 feet, which equates to around 150 meters. The push button is IP44 rated, which means it is waterproof, although it is not as waterproof as some of the other options on this page. The push button can be fixed to the doorframe by using the screws of the adhesive tape, as with the other wireless doorbells. What we love about this particular easy chime by 1byone, is the looks. If you have a great looking house and you want a wireless doorbell that will complement the minimalistic look, then you should look no further. In terms of features, it is very similar to the other easy chime, but it does have a longer working range and has been rated to work at 1000 feet. If you like to not be disturbed, you can even switch off the chime and just watch the LED flash as you ignore your visitors! A 12-month warranty will give you some confidence that you are buying a safe and dependable wireless doorbell. The 1byone Easy Chime is a classic wireless doorbell that has so many excellent reviews on Amazon. This is another fantastic expandable wireless doorbell that has never let me down (yes, I do own one of these!). In fact, I have 2 of these in my household! One for my front door, and a 1byone Portable easy chime because my son wanted a wireless doorbell for his playhouse! When you compare the features with the other options on this page, you can see why. For a start, the working range is not as good as the rest (300ft), and then you look at the waterproof rating. Sure, I have never had any problems with the push button getting wet (it has always worked), but other options are IP55 rated, whereas this is only rated IP44. There are only 36 chimes (ok, you may not even need that many! ), but it does have some very strong positives. The LED is easy to see, it looks great, and it can be expanded using more wireless doorbell chimes. The 1byone is still a fantastic wireless doorbell option and cannot be left off of this page. This Avantek is the best loud wireless doorbell, reaching a volume of 115dB! Trust me, that is more than loud enough! The sleek, black Avantek is a great looking wireless doorbell and one of the loudest we have heard! Not only is it loud, but it is also rated IP55 waterproof and has an operating range of over 1300 feet. This Avantek is feature packed too, and very similar to the Avantek below. Here is a run-down; 52 chimes, 5 volume levels, a working range of over 1300 feet, and a memory function that keeps your settings in the event of a power cut. It is true that Avantek product some of the top-rated wireless doorbells, and they do have some other options available, including in different colors! For weatherproofing, Avantek has made this IP55 rated and the push button can work within a temperature range of -20 °C-60 °C. 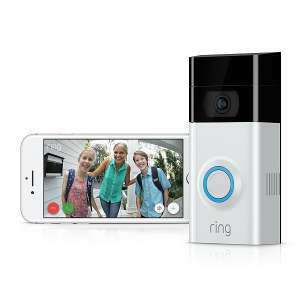 The Ring wireless doorbell 2 is an awesome piece of kit, and with a lifetime theft guarantee, and other security add-ons, it is one of the best wireless doorbells. You get disturbed even when you are not at home! The Ring video doorbell 2 certainly earns a place here! Admittedly, it is not simply a push and play doorbell, like the rest here. If not for the fantastic features, then it deserves a place on here simply because you receive a lifetime theft guarantee. When you spend this much on a wireless doorbell, it is awesome to have that reassurance. The Ring video doorbell 2 has the potential to improve the security of your home, AND alert you to any visitors when you are away (although it can be annoying). As we said above, the Ring video doorbell 2 works with Alexa, which means you can tap into the vast array of recipes on IFTTT to increase home automation. The video quality makes it the best video doorbell, the 1080p camera is a step up from the original Ring video doorbell 1 (Which only has 720p). Although most of the options on here will give you a standard ‘push and go’ wireless doorbell, the Ring 2 gives you extra! Essentially, a wireless doorbell is a doorbell without wires! With conventionally wired doorbells, you may need to enlist the help of a professional to install it for you. This will include running wires through your front door and up to the chime unit. Obviously, that means some slight damage to your door, which can be avoided by opting for a wireless doorbell. This is the unit that usually plugs into an electrical socket inside your home. You can buy portable wireless doorbells that you have to power with batteries, but in the most part, you will need to plug the wireless door chimes in. Some wireless doorbell options have multiple chimes, and some only have one. The receivers are where the sound comes from, and it is where you can set which chime sound to use (out of the many on offer!). You can also set the volume from the receiver. The push button is the part of the wireless doorbell that needs to go outdoors. For this reason, it is extremely important to ensure you are covered in terms of the weather! You need to consider the waterproof rating, the temperature range, and the build quality of the push button. This is the part that your visitors will push when they are visiting your home! Each entry in the list has a good signal range. It is very important for a wireless doorbell to be able to reach to wherever you need to put the chime. It is no good having a top-rated wireless doorbell if you can only put the chime a few feet away from the push button! If you want to put your push button outside, then it needs to be protected from the elements. A push button that is rated IP44 offers protection from water spray from all angles. Some people can place their push button inside a porch at the front of their house, which means being waterproof is not the be all and end all. If this is you, then you will have more options available. The minimum rating that we recommend for a wireless doorbell is IP33. Some of the wireless doorbells we have reviewed have a rating of IP33, they are still good enough to place outdoors. The best wireless doorbell options will have at least IP44. I have never had any issues with my wireless doorbell, but if I did, I will be much happier if it was covered by a warranty. At least for 12 months! A warranty on anything in life will give you peace of mind that if anything breaks, it can be replaced by the manufacturer. Each one of the wireless doorbells on this page has a warranty of at least 1-year. One, in particular, has a lifetime theft guarantee to boot! Whether you are after video integration, smartphone integration or even a remote locking facility, some wireless doorbells have you covered. When you consider features such a video, app, or WiFi integration, it is true that most of the options on this list do not have them. Being wireless makes them limited when you consider power consumption. Having said that, there are some feature-packed doorbells on our list. The most important features of a wireless doorbell are the waterproof rating, the distance, the chime choice, the temperature range, and the look. You cannot have an ugly wireless doorbell! The price of an awesome wireless doorbell is not high, you can probably pick up what you need for less than the price of a meal out! You will find that the price goes up due to an increase in features, but make sure you go for a recommended option. As always in life, you tend to get what you pay for. When installing your wireless doorbell, you need to ensure you read the instructions! Having said that, the process is pretty simple and does not differ much when comparing doorbell to doorbell. 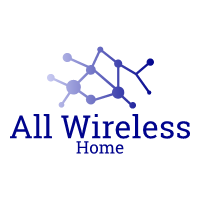 We have a post that goes into more detail for wireless doorbell installations, but here is a quick run-through. 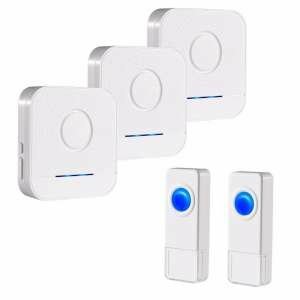 Most of the wireless doorbells on sale offer two ways of installing the push button, which is also called the transmitter. You can either screw it in or stick in on! Many of the options will already have either the screws and wall plugs, or adhesive tape, or both. My preference is to use the adhesive tape because it is less destructive to your door-frame. Although they supply the adhesive, I always have some spare, just to make sure it will not fall off. For some of the options above, you will also receive a bracket with your wireless doorbell kit. This bracket needs to be installed onto your door-frame, and the push button will usually ‘snap-in’ to the bracket. The chime is often easier than the push button! If it is a plug-in receiver, just plug it into a power socket. 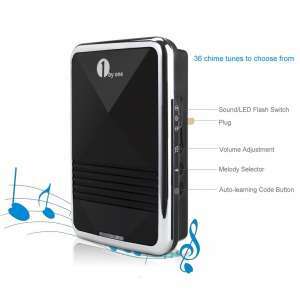 If it is a portable, battery-powered chime, then just put it wherever you want to put it! This is the part that differs per product. In my experience, it is usually a simple case of selecting the tone on the doorbell chime, and then pressing the push button. With the WiFi options, you will also need to link it up to your WiFi router, and instructions will be found with the wireless doorbell kit. We have put together a guide for you if you are having problems with your wireless doorbell installation or if it just simply isn’t working. It is best to check the manual, but use the guide if you need to. It is worth remembering, that not all wireless doorbell options are made with frequency blocking technology. There are so many things that can stop the wireless signal from reaching the receiver. If you are having intermittent signal problems, check the area around the push button and the receiver to see if there is any object that can be moved to improve stability. After splitting these options one many different posts, we decided to create one post for all of the best wireless doorbell options! We hope you will find one on here that fits your needs, I am sure you will. Do you have a wireless doorbell that you love and think it should have a place on this list? Why not get in contact with us and we will consider it as an option! Good luck with whichever doorbell you decide to go for.